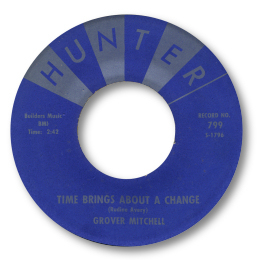 Atlanta GA recording artist Grover Mitchell got an awful lot material out on the streets than many other artists featured on the website but despite his wonderfully thrilling tenor voice and his regional popularity in the 60s he never got that big hit. Maybe that’s why his music has never had the prominence so much of it deserved. After spells with doo-wop groups like the Blue Dots and the Marktones in the 50s Grover went solo, recording first for the tiny Cindy label. Although both sides of the 45 are strong rocking R & B, I prefer his Hunter material from 1961/2. A couple of sides were leased out to Vee Jay and “Lonely Without Your Love” is a pretty fine ballad in the Jackie Wilson style. But better than that was the evocative Time Brings About A Change, obviously cut at the same sessions. The “tick tock” rhythm, “striking” bells and a doomy organ provide a splendid backdrop for Mitchell’s forthright vocal. But this was still recognizable as R & B and in my view he didn’t come into his own as a vocalist until he started singing soul. His one-off for TCF Hall, the interesting “What Happened To You” was a scene setter for his best work in many ways. It featured an excellent male chorus and a full horn section, for example, and unusually for a soul release was set in a waltz time, a time signature he returned time and again. 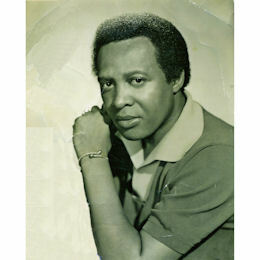 By 1964 he had moved up a league or two, recording in Washington DC with Eddie Floyd, Chester Simmons and Al Bell who leased the results to Decca. And I think this would prove to be the most successful period artistically speaking of his entire career. The first 45 was the outstanding Midnight Tears. Mitchell screams and howls out his tale of woe with an intensity matched only by Wilson Pickett over a thumping waltz beat, male singers and a big horn section. Deep soul magic. The following single I Will Always Have Faith In You from the same session was also written by Floyd and maintains the standard. On both these tracks you will hear some fine reverb guitar playing that sounds like Robert Ward’s tones – could it really be him? 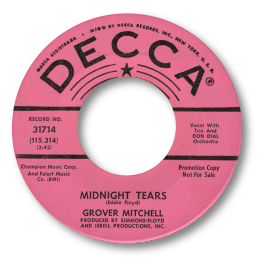 Mitchell’s third Decca 45, cut in New York, was a disappointment, the final 45 for Floyd/Simmons/Bell was a strong double sider of two big city beat ballads, no doubt left over from previous sessions. In 1966 he was back in Atlanta recording for Wendell Parker who leased to output to Josie. The first 45 was a recut of “Take Your Time And Love Me”, taken at a considerably increased tempo with more than a touch of Motown about it. Far better was the gospel ballad Sweeter As The Days Go By penned by Mitchell himself, on which his vocal group St John & The Cardinals give a beautifully measured performance as Grover screams and wails on top. Simply lovely. 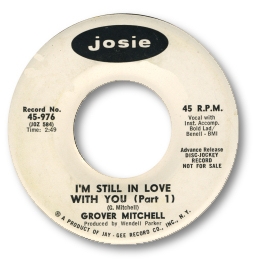 The second Josie 45 wasn’t up to the standard of the first, but the next one is the best record Mitchell ever recorded. The self penned two sided I’m Still In Love With You, yet another waltz, is one of the most intense discs ever cut in Georgia. This is a slow burning ballad of great presence which achieves it’s impact through Grover’s superbly modulated delivery, full of gospel fire and imagination. The horn charts are really well arranged and the guitarist (Freddie Terrell?) plays some very tasty licks but this realy is a disc for vocal fans for although it starts with just one backing voice by the end of side one there is a full gospel quartet. And throughout part two they gently sing the verses while Grover really cuts loose with righteous testifying – it just raises the hair at the back of my neck every time I hear it. In the 60s Mitchell spent a long time on the road with Roy Orbison who recorded at least one session with him in Nashville. Although nothing seems to have been issued in the US, in England a London American 45 came out in 1968. 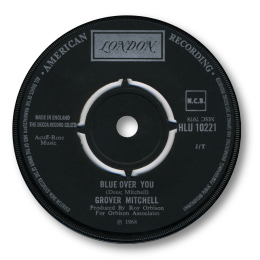 Sadly the single’s rarity isn’t matched by it’s quality, but the country ballad “Blue Over You” is a commendable oddity. And unfortunately Grover’s following recordings never reached the heights of his Josie period either. At the end of the 60s he joined producer Johnny Madara through contacting an old friend Len Barry and went with them to record in Philly. Tracks were leased firstly to UA and then to New York based Vanguard. And although production values were much higher than before Grover was considerably throttled back in his vocal style and he seemed to lose his identity in the lush Philly orchestration – and he certainly wasn’t the only southern soul star to suffer that fate. “This Old World” is a pleasant but unremarkable ballad, and dancers should check out “I Remember Mama” and “What Hurts” but it is all rather insipid. By several accounts, Bill Haney and Hannibal for instance, Grover was a dynamic figure on stage but I guess we won’t be able to enjoy that aspect of his career any more. That just leaves this wonderful legacy of recorded music. UPDATE ~ My great friend Greg Burgess has found references to Grover's life after he finished recording in the notes to Hannibal's CD on Norton "Hannibalism". According to him "'the pioneer groups at the time, in my area (1954) was the Condors and there was also L B williams and the Blue Dots'. I was in love with the Blue Dots record of 'Saturday Night Fish Fry'. Grover Mitchell sang with them and later he was the second voice on my record 'Shame, Shame'. Grover taught me how to sing bass when he was with the Blue Dots. If you ever heard Grover sing, it would make you cry. He won $20 000 playing the numbers, bought a bunch of heroin and over dosed". Sad new indeed. Greg also reports that Hannibal mentions Grover Mitchell again. He recorded 'Hymn # 5' in 1966 in the time left over from a Mitchell session. Greg also mentions that "St John and the Cardinals were a white band inclidentally and according to the internet one of them is now an eminent professor". FURTHER UPDATE ~ Eric Karten has expertly identified the guitarist on Grover's great Decca cuts as the DC based session man Al McCloud. YET MORE INFO ~ Marv Goldberg writes to say that "As far as I know, his only connection to the Blue Dots was on the one Ace record (Eddie Harris was their usual lead, but he wasn't on those sides). Grover also sang lead with the Cashmeres on "Little Dream Girl"/"Do I Upset You" (Herald 474 - 4/56) and the Marktones "Hold Me Close"/"Talk It Over" (Ember 1022 - 8/57 - the Marktones songs were really masters that had been recorded in the Cashmeres' session)." EVEN MORE INFO ~ I'm absolutely delighted to write that Grover's son Mr Tony Mincy has been in touch and has very kindly supplied the lovely photo of his father. Tony has aslo confirmed Mike Finbow's excellent detective work about Grover's real name (see Note below.) Tony has aslo said he may be able to supply more details about his father's life. There is an excellent discography which can be found here on Brian Poust’s always informative and interesting blog. Note ~ Mike Finbow has noticed that the writer of the two Hunter sides and one of his Decca sides - "There's Only One Way" was penned by Grover Mincy? I'm wondering if this in fact was his real name. Oddly enough a gentleman with that very same name cut some sides with a gospel group called The Traveling Four back in 1953 for the West Coast based Score label - a group which also featured Jimmy "Preacher" Lewis. Pity the group weren't based in Atlanta, but I still wouldn't rule out a connection. Can anybody help with this theory? With many thanks to Mike Gray, who is as mad about Grover as I am, without whom this page would not have been possible. And also to Greg Burgess and Eric Karten for his good ears.